They haven't been washed in this picture--they're right off the needles onto the feet. And the feel is wonderful, exactly what I like. And here's how they look laid out on the bench of the picnic table. They've now been worn a day, washed (no problems there) and are in their plastic bag in the sock drawer, part of the regular rotation...now ten pairs are in that rotation. As usual, they softened a bit in washing, but they didn't go all limp and wishy-washy like the purple ones did (the purples are still comfortable, however.) I have enough yarn for four more pairs like this. The next pair of socks, a soft blue-green, is on the needles, still on the cuff ribbing, and the pair after that (another emerald green) is also started, but under an inch long. Purple will probably follow the blue-green, and one of the yarns on order will follow the emerald. I have four pairs to go to reach fourteen--the two-week rotation. Then another seven pairs to reach the three-week rotation, and so on. I'm guessing that different yarns of different brands will produce socks with different durability...some may last only 50 wearings, and some will last 100, maybe even more. But the more pairs, the fewer wearings per year, and thus the more years that pair will last. And eventually, I'll have enough socks to slow down on the knitting of socks (and do something else as well) and just knit replacements for longer rotations. And I really, really, REALLY like these socks. They're very comfortable for my feet. I love those! The colour is gorgeous. I'm currently knitting a gansey-style sweater out of Cascade 220. The colour is called "Deep Periwinkle" but it's a lot more purple and less blue than your average periwinkle. It's a really nice yarn to knit with though, and I'm loving the way the sweater is coming out and I can wear purple. I've lost 5 pairs of socks this year due to old age. They all got past the "I can darn them again" stage. So I need to get working on more socks. I have one pair on the needles, but I've been concentrating on the sweater. 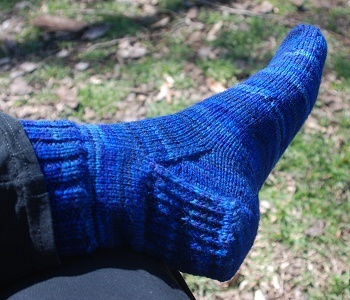 I need to learn to darn--though the fix I did on the sock with the problem was sort of darning. I think. However, my life history indicates that I'm far more likely to make more socks than darn old ones--I'm reasonably good at doing, and not so good at maintaining and fixing. My grandmother taught me to darn, back in the '50s when repairing and mending were very much the way things were. I still have her darning mushroom. And know how to use it. But when I run out of leftover yarn, or have darned the same sock more than a couple of times, unless it's a real favorite I toss it. I'd far rather knit than darn. And there's so much gorgeous yarn out there just begging to be knit. I will bet my mother's darning egg is still somewhere in her stuff. She certainly knew how to darn, but when I was a child I grew so fast I was out of the cotton socks she bought for me before they had holes in them. I've watched "how to darn" videos on YouTube several times, but the intensity of interest just isn't in my head. Yet. I would like to mend the last socks my mother made me (there's a hole in the toe of one) but thanks to fatter legs they really don't fit as well as they used to. Better then store-bought, but not as comfortable as what I'm making myself now. Oh--a question (but first an explanation.) 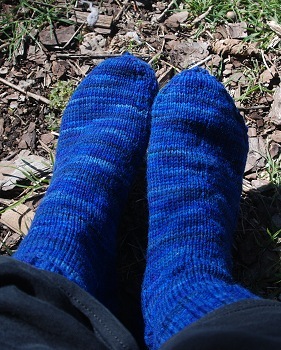 The first pair I made last year is showing wear--you can see the thinned yarn at heel, ball of foot, and toe. One of my books talks about reinforcing by running a single ply through the purl stitches on the inside of the sock, vertically, back and forth. Would that likely help that pair and give it some more wearings? Right now it's out of the rotation, awaiting some kind of help; I'd like to have it as house socks. I have already unraveled some matching yarn and unkinked the individual plies. Or, given that it's quite worn, should I use the whole yarn? I was thinking of doing this over the whole bottom of the sock. Hmmm... I've not heard of that, but it should work. Unless the sock is so worn that the purl "bump" won't hold up. I'd try it with a single ply. Using the full weight of the yarn might stretch out the worn yarn too much and encourage it to break. Thanks. I was worried about whether stuffing the whole yarn through there might stress the remaining too much...and sounds like it would. Back to the skinny single plies. That is beautiful yarn. Too bad it's been discontinued. Exactly my thought. Why discontinue such a gorgeous color? There were a couple of others I liked fairly well, and would have bought, had they not disappeared too quickly. But I needed to touch and cast on the yarn before being sure I wanted that much of it. is that super wash yarn? No, it's not Superwash. Most of my socks aren't, and--after washing the ones that are--I've decided I really prefer the non-Superwash. It's not that hard to wash my own socks by hand (it would be if I were "socking" a large family!!) and the Superwash yarn always costs more, too. And another thing--it's been decades--lots of them--since I had this many pairs of socks that fit and did not hurt my feet. For that matter, several decades since I had ANY socks that didn't hurt my feet and legs. In fact, I'm not sure I ever did have this many--maybe as a small child (but I was always growing out of my socks, so my mother didn't buy many pairs of any one size.) I had some comfortable-enough socks at various points in my life, but never an abundance of them. So this is luxury already...I can count on having clean, dry, comfortable socks every single day. They turned out lovely, and seem to fit your feet very well. The next pair of socks, a soft blue-green -- Oooo. It's a very pleasant color. Not heart-stirring, like the Isle of Sky or the emerald or purple heather, but pleasant. Beautiful color and nifty knitting. I'm glad you are indulging your feet. When your feet are happy the rest of you goes along for the ride. My father found that crewel yarn was good for darning. His socks were lighter though, but two strands of crewel might be a good reinforcer. And there is a huge range of colours so you can match - or have fun with contrasts! 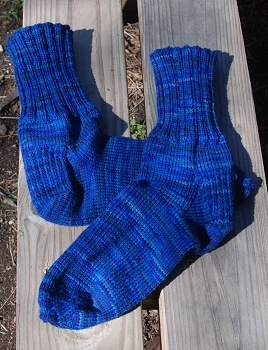 I showed the pic of the finished socks to a fellow artist--we were both just blown away by the purity and saturation of the blues-beautiful. The knitting pattern just concentrates all of those colors perfectly--a fantastic blend of beauty & function to make art. My name is Karen and I don't do the things that make me anything but anonymous. I play with sewing, knitting, crochet, embroidery, needlepoint, and -- with the greatest of pleasure -- with dying. I've never found such joy in a solid color as I have in the variagated shades that our ancestors must have taken for granted. Still, there is something about the vividness of that blue, mixed as it it is with subtler shades that makes me think of God's own creation: of lapis lazuli veined with lesser minerals; or the color of the sea on a particularly brilliant day. Even of the colors of the heavens themselves, with a hint of blessed rain in the future. I hope you will wear them with joy. I wear all my socks with joy, but I really do like those. Leaving them in the rotation is an exercise in self-discipline. Today I'm wearing the medium "denim" blue; yesterday I switched to get a green for St. Patrick's day, which put the blues back one day. I have several to go before the variegated blues are "up" again. I don't recommend it, but it's happened to me enough times that I mention how I came by my love of dying. If anything ever happens to these or anything else you love for other reasons, my best advice is to get some cheap RIT dye, a bottle of white vinegar big enough to give a good "glug" to a pot able to let your garment swim (but not one in which you will ever cook food -- a galvanized wash tin works just fine), then boil the dye mixture first (unless it's wool, in which case, letting the wool warm with the water prevents most shrinkage). Once you've immersed your garment, don't so much stir (I use take-away chopsticks since they're free and disposable) to occasionally check on the depth of color. If you're at this dire point, you're looking for something like you'd expect the shade to be just after you washed it. I'm not providing this information because I hope you'll or any of your readers will ever want to try it just on my say-so but because the first time I got anything as beautiful as the shades of your socks came about because I'd spilled (badly) on a cashmere sweater that had been a gift. I still get compliments about the beauty of the unexpected shades of green that developed, quite by accident. In other words, great compliments on your beautiful socks -- and vive la diference between solids and colors that seem to move and shift with photons themselves! I think that I have solved the lacy gusset problem. The latest sock I have done when I was picking up the stitches along the gusset I picked up half of the stitch behind the edge stitch if it looked like the edge was a bit too slack. Worked a treat! Let me be sure I understand exactly where you did that. 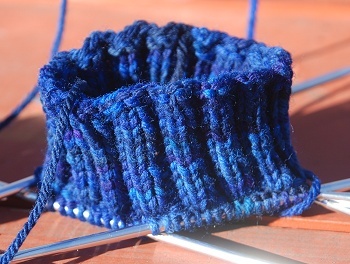 I'm not having a problem on the side of the heel flap, when picking up stitches--those are nice and firm. If that where you're picking up stitches? My problem is on the slanting line where the decreases are--the hypotenuse of the triangle--and the gap between the decrease stitch and the stitch next to it toward the top of the foot. This occurs only on the left side of the socks, only when I'm decreasing on every row, and only with (so far) one brand of yarn. I agree that if I could somehow connect half the stitch "beside" the gap to the decrease-stitches, that would work. But I don't know how I can do that where it needs it. And I'm wondering if decreasing every row if the problem--there's always that one stitch a little looser (as in any decrease) and it's not anchored in alternate rows by straight knitting. The steeper angle of the gusset triangle fits my foot better: I have a high instep but also high arch, so I need room over the heel-to-instep measurement, but then the circumference of the foot diminishes sharply as the arch rises under the high instep. But if it's the decreases leaving one stitch (and thus end of row) slacker, especially in that specific yarn, then one fix might be shortening the heel flap a little and using the recommended decrease every other row. Straight-knitting across that gusset margin every other row would maybe (?) anchor the decrease rows and keep them snug. My solution concerned picking up the stitches on the side of the heel flap. (Especially at the base of the triangle) I suspect that yours is indeed because you are not doing a row of straight knitting. Perhaps 2 decreases in a row than a row of straight knitting would work. That's what I'll try on the pair that's about to have its gusset done. Thanks.